This is another building that I built whilst I was away on holiday along with the factory building. I built it to fit in a curved triangle space at the corner of the layout created by the loop of track in the town area. This is the most complicated scratch build I have attempted, and as with the rest of my buildings is made out of cereal box card and superquick brick paper. On the whole I think I have made a good job of the building although there is still a long way to go and room to improve. 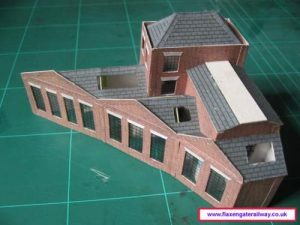 Some of the edges between the roofs and walls don’t quite match up and it is missing details such as guttering and skylight windows. I’m hoping the counter the roof and wall gaps problem by using some extra coloured paper to cover the gaps and look like lead flashing. 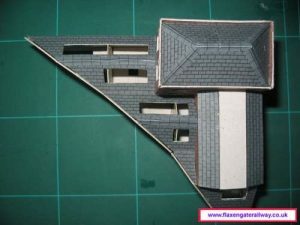 The white flat part of roof is an incomplete part fo the building. I’m hoping to raise this part a few milimeters and ad another apex on top hopefully making a two tiered roof look.